GET A $50 OFF $150+ QUALIFYING PURCHASE WHEN YOU APPLY FOR A CREDIT CARD OR DEBIT CARD BY MAIL OR GO HERE TO APPLY ONLINE. Once you’re approved, a coupon for $50 off a qualifying purchase of $150 or more will be mailed to you with your new REDcard and you will be able to use your $50 coupon on eligible items through May 25th! Hop on over to Target.com where you can score the new Target Beauty Boxes for April for just $7 shipped! Mark your calendars! The Target Car Seat Trade-In Event will be happening at Target stores starting April 22nd and lasting through May 4th. Guests who bring in their old car seat to guest services will receive a 20% off coupon good on a purchase of a new car seat, stroller or select baby gear purchase. Mark your calendars! 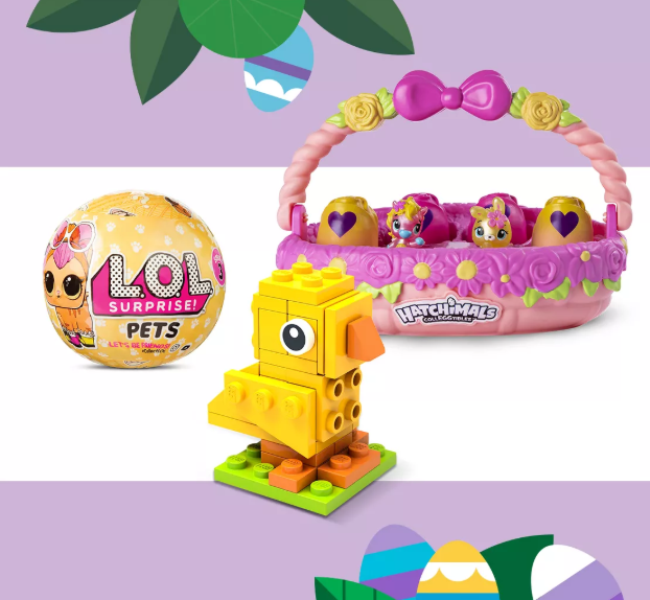 Target will be hosting a FREE Easter Toy Egg-stravaganza event on Saturday, April 13th, from 10-1 pm. Kids will get to enjoy interactive toy stations featuring LEGO, Hatchimals and more. There will be fun photo ops and giveaways too. Click the Join now button and fill out the survey for a chance to be acceptedinto the Bullseye Insiders Program from Target. They have product tests and surveys where you can win prizes. They're looking for certain demographics, so you might not be able to get in right now, but you can keep trying. Right now, it is available in Charlotte, Denver, Indianapolis, Kansas City and Phoenix. Click here to get this FREE baby registry kit from Target!